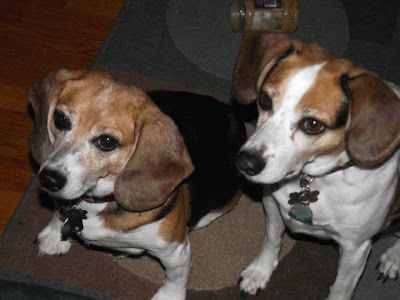 From: Minchy, bred by a "backyard breeder," came from a family who wasn't able to care for him; Frances came from the Tompkins County SPCA in Ithaca, N.Y.
Kerry (who blogs at Hamchuckles) sent the stories of her two dogs—below is Minchy's, and tomorrow's post will feature Frances' tale. I have two adopted dogs who are the absolute light of my life—Mr. Minchy Spampobello and Frances Serena. Both came from unhappy situations and came to us with issues and emotional baggage. It's so enormously rewarding to see how they've grown and overcome their rough beginnings. They mean so much more to me because they needed me so. I worked for several years as fundraising director for our local shelter, the Tompkins County SPCA, a no-kill shelter since 2001, and I saw firsthand the joy and fulfillment that adopting a rescued pet brings to our lives, as well as theirs. My husband and I moved to the Ithaca area in spring of 2003. We chose where we would live based primarily on the fact that we wanted—needed—a dog. After taking a couple months to settle in, we decided on Labor Day weekend to begin our search. Our SPCA was closed for the Labor Day holiday, but we could view dogs ready for adoption on their website. None of available pets really spoke to us. On a whim, we checked the "free to a good home" ads in the newspaper. There was an ad for a young beagle/Jack Russell pup, a combination we both liked. My husband called; we were one of many interested in this dog. We were persistent, however, and by the end of that day, we had a call back saying that no one else who showed interest was able to take the dog immediately. If we could, he was ours. We jumped in the car and drove through a pounding rainstorm. Minchy was one of a litter of two. A college student in the area thought it would be "fun" to breed hunting dogs, then realized what he had wrought. When we went into the basement to see our potential pet and his brother, it was like watching two Tasmanian Devils on a rampage. I never even got a really good look at him until we had him in the car 20 minutes later. The family who was giving him up was friends with the student who'd bred the dogs. They agreed to keep one, but couldn't handle both of them. Minchy was passed around to several homes before he got to us, including a nearly blind elderly woman in a high-rise apartment who thought this very obviously unneutered boy was a little girl. 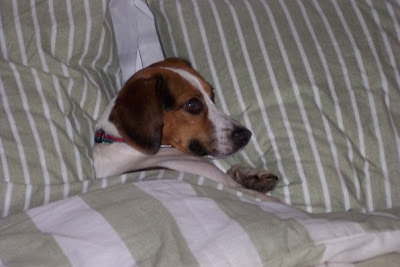 By the time he came to live with us, he had a severe case of separation anxiety, in addition to his intense energy, beagle stubbornness, and Jack Russell intelligence. He was a handful, to say the least. The minute we left for work (and leaving the house was a major production, involving Minchy hiding and avoiding capture) he would destroy. He chewed CDs that were on shelves in our bedroom, chewed the shelves, tore apart a handful of beaded bracelets, turned his little bed inside out and shredded the foam to bits, and frequently peed on our bed. In spite of all this, we never once thought of giving him up. He was ours, part of our family, and if he was having troubles, we'd do what we could to help him through them. I started working as fundraising director at our SPCA about eight months after we adopted Minchy, and it was a lifesaver. I got advice nearly every day from the shelter dog behaviorist, who was the one who diagnosed Minchy's separation anxiety. She gave us many techniques for working to quell his panic when we left the house. Having him neutered, as well as learning to use treat-filled Kongs as distractions, helped to calm our boy down and become less destructive. 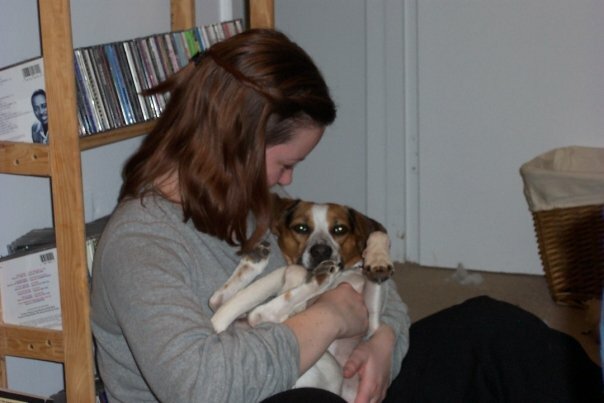 Even at his worst, he was the most loveable of dogs, snuggly in a way my childhood dog never was. The first night we brought him home, we'd made a little bed out of blankets for him at the foot of our bed. He took one look at it and jumped up on our bed, burrowing down under the covers between us. I remember he looked at both of us like, "Hey, guys! Nice to meet you! Good night!" Part 2 will feature Frances' story.